Education Secretary Betsy DeVos started Friday, the last day of her back-to-school tour, facing more protesters than students. About 150 foes gathered outside the Kansas City Academy, a small private middle-high school that emphasizes the arts and is known for its acceptance of LGBT students. The school enrolls about 75 students. Protesters registered their disagreement with DeVos’s decision to rescind Obama-era guidance that required schools provide transgender students access to facilities matching their gender identities, The Kansas City Star reported. The fourth and final day of DeVos’s “Rethink School” tour took her to Missouri and Indiana, where she visited a charter school that allows students to earn college credits. She’s also set to visit Hope Academy, a charter school for students struggling with drug and alcohol addiction, in Indianapolis, and take in a football game at Eastern Hancock High School in Charlottesville, Indiana. Earlier this week she visited Wyoming, Colorado, Nebraska, and Kansas. She kicked off the tour urging the country to embrace “dramatic change” in the educational system. 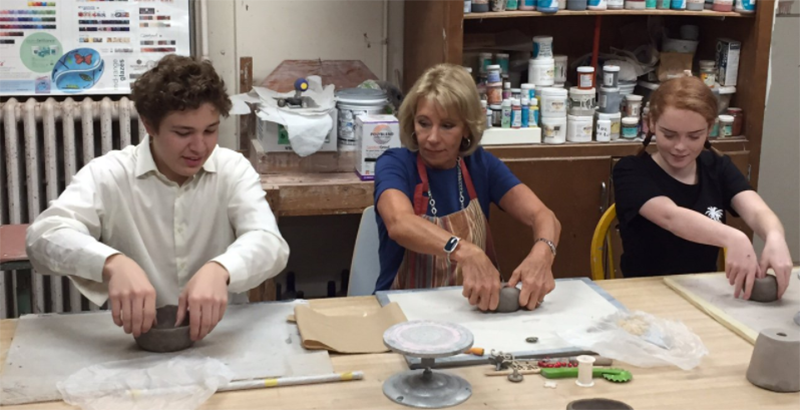 While at the Kansas City school, DeVos visited a ceramics class, where she made pinch pots, and cooked up veggie burgers with the culinary class that prepares the school’s lunch every day with ingredients from the school’s garden, KCUR reporter Elle Moxley tweeted. She also visited and had a roundtable discussion with students in a world history and government class, who wanted to know why she visited. 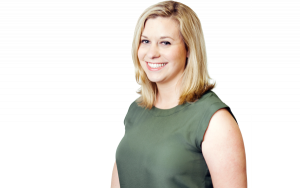 “I’ve been visiting schools this week that are doing things differently, creatively, and innovatively, to meet students’ needs and to help students find a good fit for them,” she said, according to KCTV, the Kansas City CBS affiliate. The question of whether to host DeVos rankled school leaders, who ultimately said their values of inclusivity and being open to different viewpoints led them to agree to the visit, Public News Service reported. There were a few protesters at DeVos’s second stop, in Gary, Indiana, where she visited 21st Century Charter School and Gary Middle College, two charter schools that allow students to also take classes for college credit. Betsy DeVos poses for a photo with students during her back-to-school tour. The middle college, which has a staggered schedule that stretches well into the evening to serve non-traditional students, is “a great example of how schools can meet the needs of specific students,” DeVos said, according to the Indianapolis Star. The 21st Century School attracted national media attention when Raven Osborne earned a college degree while still enrolled in high school. In fact, she was awarded the college degree, from Purdue University Northwest, a few weeks before her high school diploma. She was part of the panel discussions.